Quantum Reflex Analysis (QRA) is an advanced system of kinesiology using the scientifically researched 'Bi-digital O-ring' technique. This university-proven energy testing technique has been shown in numerous research studies to be both reliably accurate and to generate reproducible results. QRA combines aspects of Traditional Chinese Medicine (TCM) with the latest findings in bio-energetic medicine to help the practitioner gain insight into what the body may need to support healing. QRA is the result of 30+ years of intense research and development by the team at Premier Research Labs (PRL) and the international network of QRA practitioners. During a QRA session the practitioner tests key acupressure points on the body to determine a weak or strong bio-energetic response. A component of QRA is to be able to assess the energetic strength of supplements, medicines and foods specific to the client. Advanced QRA techniques allow the clearing of both emotional blocks and physical traumas that may be preventing a client from achieving optimal health. Ask us about QRA or arrange a consult today! I have applied QRA in my practice for two years now, and I wouldn't be without it. It is astounding how relevant and consistent it is to each and every case. Patients have been astounded by the QRA, and the clinical results – where nothing had worked before." One of the great things with using QRA is that it is a testing technique that actively involves the client/patient. They get to feel their own body's response throughout the process and as a result this improves compliance with their personalised health programme." QRA Level 1 is a three-day intensive course designed to introduce and teach the fundamentals of QRA. The course is designed in a way that enables you to use it straight away with your clients. There is plenty of time for practice, demonstrations, and case studies at the course. After completing QRA Level 1 you will be able to work with complicated cases and have a clearer direction of what the priorities of the body are. QRA practitioners have access to a support network of experienced practitioners via phone, email, skype and an online forum. Take your QRA skills and knowledge to the next level with QRA Level 2. Learn advanced QRA protocols and take a much deeper look into the energetic body. Get the tools to address even the most difficult cases. Unblocking interference fields that can result from physical trauma to the body from injuries, surgery, tattoos, scars, dental toxicity etc. Both courses go way beyond learning QRA techniques and procedures, and into applying quantum thought practices and principles into your practice. Note: QRA Level 1 is a prerequisite to attend QRA Level 2. QRA counts towards your CPE and all attendees will receive a certificate at the completion of each course. Robin Day is the Founder and Managing Director of BioTrace Limited. In 2004, after several years of independent study, Robin commenced importing living source nutritional supplements to assist with his own long term health issues. As distribution of these grew, he incorporated BioTrace in 2005. In 2007 Robin met with Dr Marshall, CEO of PRL Laboratories, a research-based supplement company based in the US. Dr Marshall and his partner Dr Linda Forbes developed the QRA modality by merging elements of bio-energetic medicine with acupuncture, kinesiology, and the scientifically validated bi-digital o-ring technique created by Dr Omura. Dr Marshall was practising and teaching QRA to natural health practitioners in the USA. Robin was so impressed with the clinical results documented by Dr Marshall that he began his own training immediately and set the wheels in motion for bringing QRA to New Zealand and Australia. BioTrace ran their first QRA practitioner training course in New Zealand in October 2008. Senior QRA practitioners came from PRL in the USA to New Zealand to teach QRA alongside BioTrace staff for the first three years. Since 2010, to ensure the team at BioTrace remain up to date with the latest developments in nutrition and QRA techniques, staff regularly attend QRA Practitioner Advanced classes in Austin, Texas. BioTrace is the only company outside of the USA to successfully gain approval to run QRA Training. 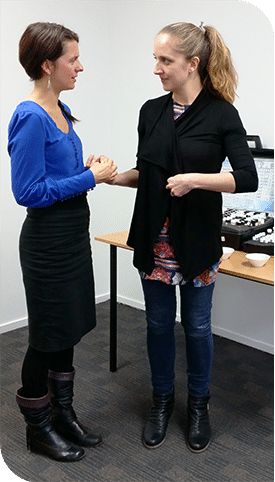 Since that first QRA training course in 2008, BioTrace has continued to run both Level One and Level Two training in New Zealand and in 2012 ran their first QRA course in Brisbane, Australia. In addition to this Robin runs a successful QRA clinical practice at BioTrace and has done since 2011. He has clients across New Zealand and in several other countries including Australia.